Outdoor flood lights illuminate your favorite sports fields so you can watch the game at night. Landscapers use special outdoor flood lights to highlight their designs, while some home and commercial security systems use outdoor flood lights to frighten intruders. Some outdoor flood lights are even used for concert lighting. We reviewed several dozen outdoor flood lights to find the best of the best. We looked at price, bulb type, and ease of installation, among the other features for each model. The Hyperikon LED Outdoor Flood Light with Motion Sensor stood out as the best option for most property owners. It boasts easy installation and built-in motion sensors, and it’s available in one head, two head, and three-head options, so you can choose the amount of lighting that best meets your needs. And because it’s an LED light, you won’t be spending a fortune on frequent bulb replacements. 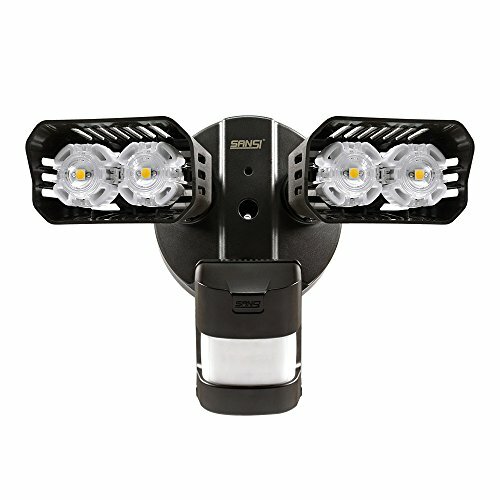 If you’re looking for something affordable that’s earned a reputation for reliability among consumers, the Hyperikon LED Outdoor Flood Light with Motion Sensor is the best choice. Its super-bright 20W lights illuminate your yard, providing great visibility across your property. Its built-in motion sensors will detect and scare off intruders, and its convenient dusk-to-dawn sensors mean it will only be on when you need it. This model is easy to install: simply mount it to a wall and plug it in. It covers 30 to 40 feet, and it’s waterproof, so you can use it in all waeather conditions. The Hyperikon LED Outdoor Flood Light is backed by a 5 year warranty. 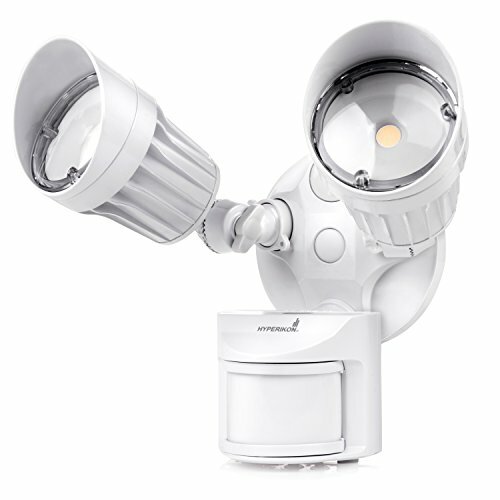 The Leonlite 20W Dual-Head Motion Sensor LED Outdoor Flood Security Light is an outdoor flood light with many available options. You can order it to install yourself or with expert assembly. It comes in 2-, 3-, and 4-head versions, so you can choose the coverage that you want for your space. It is also available in a bronze and a white color instead of only black or white. This model has three modes: On Time, Auto, and Dusk to Dawn. Dusk to dawn mode turns off the light in the daytime when it isn’t needed. An LED model, it lasts longer and is more energy efficient compared to flood lights that rely on standard bulbs. In situations where you need a cost-effective lighting solution, the LLT 20W LED Flood Light is your best option. Although it is available for an affordable $14, it shares many of the same features with higher-priced alternatives. This 20W version can be used in commercial and home uses to light walkways and workspaces. At 1,600 lumens, it produces a bright white light that is highly visible. One of the best features of this light is its weight. It weighs only 9.6 ounces and has a small profile that makes it easy to install in most places. The swivel mount has a full 180-degrees of rotation, and the round attachment end makes it possible to rotate it as well. It can be installed on poles or wall mounts with internal wiring. This model comes in a 20W white finish, but there is a black finish as well as a 10W and 30W alternative. This light also has a 20,000-hour lifespan so that you won’t have to replace it for years. New Craft 50W LED Flood Lights is your best LED lighting option. Its design lets it stand up to the elements and provide light consistently. It is IP66 rated for waterproofing and uses a specially-designed heat sink that uses ridges to improve cooling. The power chord is also sealed at the input to keep it watertight. This light uses a 50W LED, which is enough to replace a 250W halogen bulb with 80% less energy consumption. The reflector array uses a scaled design that catches more of the light and directs it outward toward the focus of the LED. That way, it appears much brighter than a normal light since more of the light is used effectively. At 4,000 lumens, it produces a 6,500K bright white light that can fill any area. 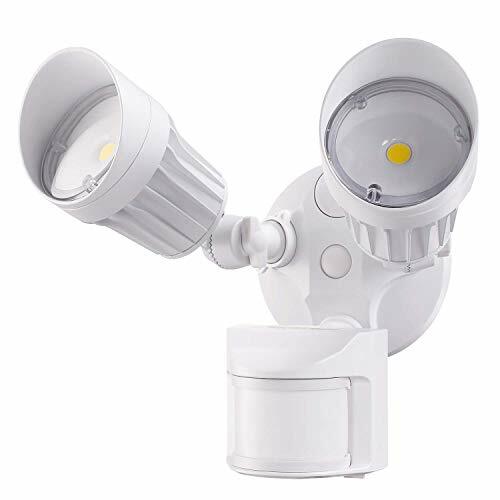 SANSI LED Security Lights offers the best combination of features for a security flood light with motion sensors. It has two light heads which give it a wide angle of area coverage. Four LED lights produce 1,800 lumens of light, which creates a bright white light. Despite its brightness, it only draws 18W of power to reduce your electricity consumption. When mounted properly, this light can be an effective deterrent to criminals. It should be mounted at least 8-feet off of the ground, which will let it cover an 861 square foot area. The motion detector is highly accurate and has a range up to 50 feet. The motion detector automatically turns the lights on and off, flooding the area with bright light to scare off intruders. Outdoor flood lights are great for recreation centers and public spaces. However, they are excellent for homeowners, as well. No matter if you live in the city or in a rural area, outdoor flood lights can make it easier to see where you’re going at night. If you pull up into your driveway, a motion sensor can cause the light to turn on to illuminate your path. It can also ward off intruders who rely on the darkness to sneak into your home or commercial space. Some flood lights offer ways to direct the light and can be used in landscaping displays. Most homes can use flood lights in both the front and backyards. Apartment renters should check with their landlords before installing an outdoor flood light. Lumens. The brightness of lights is measured in lumens. The higher the lumen count, the brighter the light is. Flood lights, in general, have a lumen count of 1,000-10,000 lumens. Most flood lights will have a lumen count in the 5,000-7,000 lumen range, with lower lumen lights for indoor and soft setting uses, and higher lumen lights for commercial use. Motion sensor. In places where flood lights are used for security purposes, it is important to have a motion sensor. This allows the light to shut off to conserve its bulb life and electricity, and to respond when it is needed. Most motion sensors use an infrared mechanism to sense unseen people, animals, or objects moving within 50 feet of the light sensor. Light color. Lights come in a variety of colors and shades that can be used to customize the viewing experience. Some flood lights use an LED array to create a wide range of different colors. Other lights give you the option of choosing a shade of white light. This light is referred to as warm (more red light included) or cool (more blue light included). LEDs. LEDs (Light Emitting Diodes) are a popular type of light bulb. They often produce higher lumen counts, are more energy efficient, and are more durable than halogen bulbs. LEDs have widely replaced halogen and other types of bulbs due to their cost-effectiveness and other options. Heat sink. One of the most important features on a flood light is the heat sink, which disperses the heat generated by the light source. Flood lights tend to generate high amounts of heat and need fans or specially-designed heat sinks to quickly disperse that heat. Ridge heat sinks are often used to increase airflow and contact, which lets the light cool faster. Light heads. Flood lights can have multiple light heads that point in different directions. The most common forms are single and double light head combinations. However, some models can have three or more heads depending on their design. In most cases, each light moves separately from the others. Power source. Every flood light has a power source, and there are two main options to choose from. 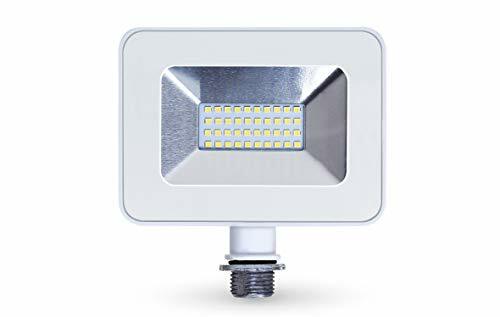 Most outdoor flood lights use an integrated wired connection similar to how most other permanent electrical appliances are wired. They connect directly to the power grid. Other lights use a three-pronged plug similar to most electrical devices. Mounting equipment. Special mounting equipment may be needed to mount flood lights. These include screws, mounting rings, and other hardware components that are specially fitted for each model. Mount. Every flood light needs a mounting system to install it, and that mount is integrated into the design. Swivel mounts are the standard for outdoor use give users better control over which direction the light is pointed. Day/night light sensor. Flood lights with a day/night sensor can turn themselves off during the day, which not only saves time, but reduces energy usage. What does a flood light do? A flood light is a light fixture that produces enough light to brighten (or flood) an area so that it becomes highly visible even at night. Flood lights are generally used outdoors to light homes and the areas around business buildings for security purposes. These lights have a high output and are generally designed to produce a bright white light that heightens visibility. In most cases, flood lights are used for security purposes. Having a bright light that makes an area bright enough to see in deters crime since criminals cannot hide from onlookers or security cameras in the light. However, lower-powered flood lights can be used indoors to create lighting effects and to help illuminate large event spaces. Can you use an indoor flood light outdoors? It is possible to use an indoor flood light outdoors, but it is not a good idea and can be dangerous. Indoor flood lights use bulbs that are lower-powered since the light will be reflected off of surfaces and kept in the room. These lights are also not designed for outdoor use, which creates several problems. Aside from not being bright enough for outdoor use, indoor flood lights are not built to resist the weather. Outdoor flood lights are made to be waterproof, have concealed or sealed power sources, and are more durable than indoor lights. While you could use an indoor light outdoors, there is a high likelihood of rain, snow, or heavy storms damaging it, which could lead to an electrical fire. How do you reset a motion sensor light? In flood lights that have motion detectors, owners may experience problems with the sensing unit for a number of reasons. Common problems, like quick power outages, can cause the sensor to act strangely. While virtually no motion sensing flood light has a reset button, it is possible to reset them. To reset a flood light’s motion sensor, simply cut the power for a set amount of time. The amount of time depends on the model, and can be found in the owner’s manual. Some units require an outage of 30 seconds while others require as long as one hour to reset. If a problem occurs with a motion sensor, locate the breaker switch that controls it, and turn it off. When the right amount of time has elapsed, turn it back on and test it. How high should a flood light be? The placement of the flood light depends on several factors including its brightness, the opening angle of the light, and what it is used for. The brighter the light in lumens, the further away from the area it can be. However, the light is generally placed relatively close to the intended target to get the best visibility. Determining the right height for a flood light depends on the area. For most homes, a flood light that is illuminating driveways and areas close to the house should be placed as high as the top of the garage. That places it high enough to be out of easy reach, but low enough to give good light coverage. Lights that are illuminating objects above them are generally placed on or near the ground. Regardless of what the intended target is, the light should always be three or more feet away from the target as they generate heat and intense light can be damaging. We looked at 20 other outdoor flood lights. Even though they didn’t make our 5 best outdoor flood lights list, they’re the best of the rest and each is still a great option for your outdoor adventures. The information you’ll need to compare each one is included with the listing. The All-Pro Twin-Head Outdoor Security Round LED Flood Light is a good all-around option. It is available in bronze or white so that it fits into any house color scheme. Because of its low profile design, it fits into most places easily and provides wide-angle coverage to open areas. This AMMON IP65 LED Flood Light is a top pick for spaces that need a lot of focused light with the flexibility to aim it where it is needed. The light is lightweight and has a sturdy mount built into its design. The single panel LED lights focuses the light into a specific direction, letting you get the most out of the flood light where you need it to go. Lighting an area is easy with a FAISHILAN 100W LED Flood Light since it has a 150-degree light pattern. At 9,000 lumens, it is one of the brighter options available while still keeping the light focused. At a manageable cost, you can use several as an outdoor home or building lighting solution with multiple lights in a pattern or covering all outdoor areas. You can use GKOLED 45W Outdoor Security LED Flood Lights to cover an outdoor area that you need to have lit at night for security reasons. At 5,400 lumens, this light can cover a large area bright enough for security cameras and other security features to see clearly. It also comes with a universal swivel mount which makes mounting and positioning it easy, especially since you don’t have to redrill holes to change what direction it is pointing in. Installing outdoor flood lights in hot areas can lead to them overheating, but the GLORIOUS-LITE IP66 LED Flood Light is designed to control heat build up. The back casing uses a grooved design, which improves airflow around the light. That way, it is able to dissipate heat faster. A pack of flood lights opens up a lot of possibilities for lighting options. This Hykolity 200W LED Flood Light comes in a 2-pack to give you better coverage over a wider area. They have highly-adjustable mounts that make them easy to position and specially designed heat sinks that keep them cool even in hot temperatures. With an extremely high lumen output, they can brighten any area for high visibility. If you need a flood light to cover a limited area in your yard or around your home, the Best World LED Flood Light is a good option. It is waterproof to withstand the weather and installs easily in most places due to a thin pivot mount. The coverage area is limited so that you can place it tastefully in patterns to light your outdoor spaces. It works well as a wall-mounted light too for walkways and house sides. The Leonlite LED Outdoor Flood Light is just right for porch and close area applications. It projects in the 3,000K range which makes it have a warm white light. You can use it as a porch light where you need wide coverage, but don’t need a really strong bright light. It also comes with a day/night sensor so that it will turn on automatically at night. You can use the Lights of America Outdoor Security LED Flood Light as a high position light that mostly points down toward the ground. It does not have a reflector array like most lights, which gives it a wide dispersal angle. That allows it to cover a wide area under the light with a bright, 3,000 lumen light. It works great for lighting areas that are almost directly below it like on the sides of buildings or over walkways. This Hallomall Solar Flood Light is useful for lighting doorways and walkways. It is solar powered and charges in under 5 hours at an 18% conversion rate. The solar panel and lights are highly adjustable, making it possible to position them for the best light easily. The lights have an adjustable output so that you can tune it for the area that you want it in. It also has a built-in light sensor that shuts off the lights during the day. 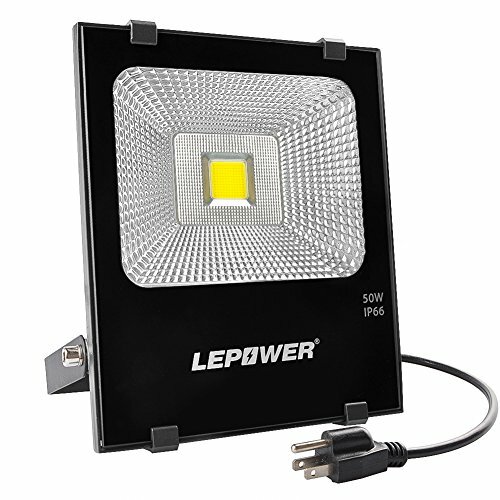 This Topele Led Flood Light can be used for a close range area light that is bright enough without being overpowering. It is available in a single or double light fixture in either black or white. With a very flexible mounting bracket, you can aim it in just about any direction that you need to. This light works well for low-hanging house fixtures like garage lights or porch lights for added security and visibility in the dark. If you like to add new colors to your landscape designs, this Ustellar RGB LED Flood Light gives you 16 color options to choose from. It also has four modes that let you customize how it lights an area. It is dimmable, which lets you adjust the brightness for the area that you need to cover. This light comes in a 2-pack making it easy to get the coverage that you want. Some users also use it for stage lighting and event venue lighting because of its color options and dimming ability. This Ustellar 2-pack of 60W LED Flood Lights can be used for lighting landscaping. They put out a 5,000K daylight equivalent at a wide angle. The body of the light is thin, making it easy to angle for proper coverage. The body of the light is waterproof and used a ridged back for better airflow and cooling. The warmoon Outdoor Flood Lights let you control the color of the light and add some color to your landscaping. It can generate up to 16 distinct color options. The power source is a grounded 3-prong U.S. plug, making it easy to install and move just about anywhere. These CINOTON Led Security Lights offer a low-powered, high-visibility security alternative for home use. It has a built-in motion detector that can sense movement up to 50-feet away over a 180-degree angle. It puts out a 5,000K crystal white light that drastically increases the visibility within the area. This Hubbell-Bell LT233WH Traditional Outdoor Flood Light Kit gives you a simple option for improving your outdoor lighting. It is a lightweight, dual light fixture that is easily angled for full area coverage. With bronze, white, and gray finish options, you can easily integrate into your house’s design. All of the mounting and hookup parts that you need are included. For a simple lighting solution, go with the Lithonia Lighting OFTM 300Q 120 LP WH M6 Mini Twin-Head Flood Light. Its double head design and rectangle lights give it a wide area of coverage. You can adjust it without needing tools as well. Perhaps the most fundamental on this list, the Lithonia Lighting OFTH 300 PR 120WH M12 Twin Par Holder Standard Outdoor Flood Light gives you the simplest option for outdoor lighting. It uses the standard halogen bulbs and comes in an easy to install setup. These Nuvo Lighting SF77/495 Two Light Outdoor Heavy Duty Cast Aluminum Durable Weather Proof Security Flood Lights offer a more robust lighting option. It is made out of cast aluminum for extra durability. It is easy to adjust using simple tools like a screwdriver. If you are looking for a lighting system for a large area, this Two Light Outdoor Heavy Duty Cast Aluminum Durable Weatherproof Security Flood Light comes with multiple units for better coverage. They are heavy duty Alumnimum lights with encased bulbs for added durability. They are also lightweight and easy to adjust with just a screwdriver. Melanie Green is a freelance writer who has written professionally since 2006. After leaving her full-time writing position at Nielsen, she's had the opportunity to have her work featured on a variety of websites, including Geek Insider, Hubpages, and Recruiting Blogs.